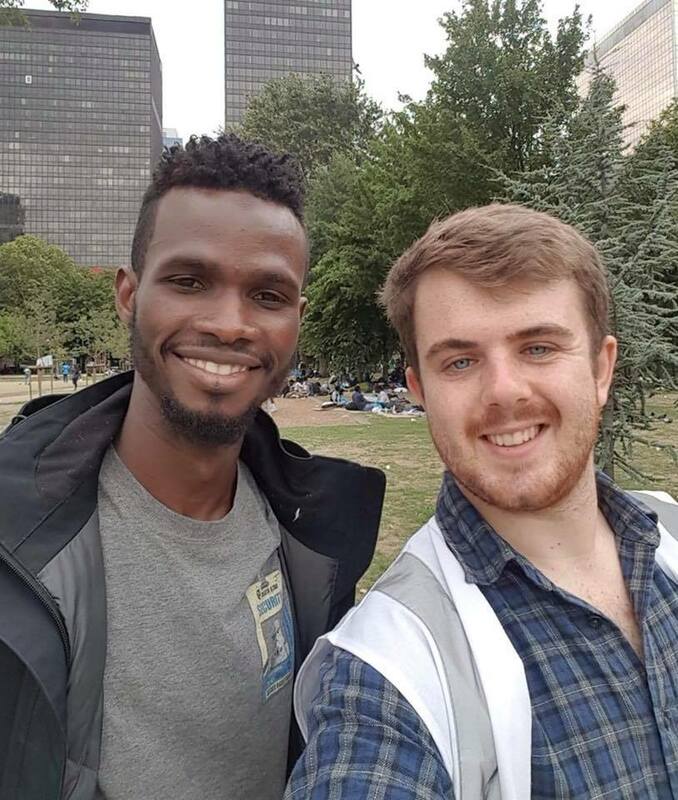 This is a picture I took with Mubarak, a 24 year old trainee doctor from Sudan, who I met in a park in Brussels. He lives in a tent near the broken absail but came out to collect a t-shirt and a small pack of essentials from the Care4Calais van. We got chatting and Mubarak told me that, shortly before leaving Sudan, he had completed his degree in medicine. He wants, eventually, to be a gynocologist and has actually delivered five children. He showed me a photograph of a small boy he delivered in a migrant detention centre in Italy, a beautiful child who the grateful mother named Mubarak. The older Mubarak had to leave Sudan after being repeatedly arrested and tortured by the Sudanese government forces, a punishment for writing social media posts and attending protests against the regime. Mubarak wants desperately to live in the UK and work for the NHS. Mubarak believes strongly in the importance of peace and describes himself as a humanist. It strikes me as an act of violence and injustice that this man is being made stateless and homeless. Please, in whatever way you can, help Care4Calais to deliver aid and solidarity to the 1000s of other refugees living in and around Calais and Brussels. Getting to meet and support people like Mubarak is a meaningful and important experience and I encourage you to volunteer.